We know the importance of helping philanthropists to maximise the impact of their donation. Through our Incentivised Giving and Regional Development programmes, we can enable you to leverage your gift to help millions of people and achieve real lasting change. Our vision for Localgiving is built on the belief that local communities have the power to solve their own social problems, from the grassroots up. With a single donation, you can invest in long-term initiatives to support vetted local charities and community groups, providing the foundations for a thriving, sustainable and effective local voluntary sector. Our regular match fund campaigns give you the opportunity to leverage your gift by matching donations made by the public. 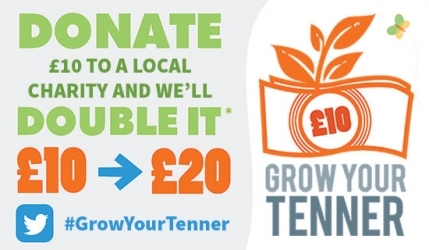 Our biggest campaign, Grow Your Tenner, can help you to reach thousands of charities and provide leverage of up to 4.9x after Gift Aid and tax relief. See our video for more info on claiming tax relief on your charitable donations here. #GiveMe5 campaigns run over a 24 hour period and provide up to 5x leverage, whilst Local Hero campaigns engage individual fundraisers over the course of a month and can multiply your donation by up to 21x. Fewer than half of groups are optimistic of their 5 year survival.